It’s not easy being green, till you know how! I love smoothies and juices (as long as the fibre remains) . I have a smoothie with a protein powder and milk kefir in the morning and I make a green juice in the afternoon to wake me up till dinner! Its a fine line between juice and cold soup sometimes! Coincidently I make mine in my Cuisinart Soup Maker as it has a pretty powerful motor and blade needed to cut through the greens and so I don’t have to peel my apples and pears. 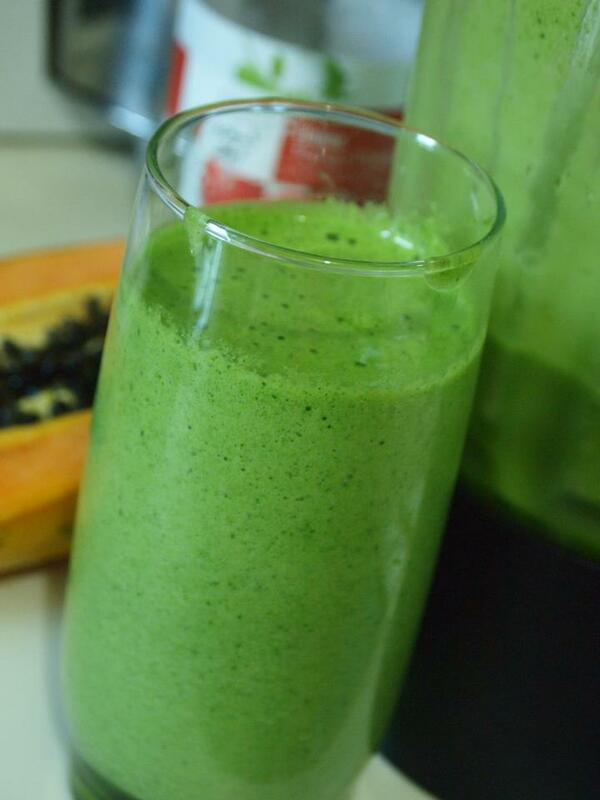 I have also made great green drinks with a normal smoothie maker like a Kenwood Smoothie to Go. I just used my green powder. So there really is no excuse! Updated- I now use a German Pool but Ice needs to be added as the motor will heat things up! You need a liquid base. Anything goes really here- coconut water ( I have been using coconut Kefir too), Water, cooled herbal teas of your choice (rooibos has a lot of antioxidants in it) or even green tea or tulsi tea (for a calming feel). I have also bought fresh juices (without sugar added) like carrot, watermelon, kiwi, mango when I have been out and not finished them so have thrown them in the juice too. This is helpful when you don’t have a super powerful juicer but want carrots in your juice. You can also use nut milks (here for almond), oat milks or any other liquid not mentioned. Then you need your greens. I find the juicer fruits better as there can be a lot of fibre in the greens so mixing with a fruit that is going to add some more liquid works well for consistency I like watermelon, honeydew melon, apples, pears and Kiwis. However berries pack a great punch to the juice. Banana’s, mangoes add a lovely sweetness (and smoothness) and pineapples add a great tropical tone! You can go sweet or savoury depending on what you prefer. You could add tomatoes peppers, lemons, herbs (coriander and sweet basil are my favs), radishes any salad ingredient really! Experiment! I find cutting up fruit and throwing them into bags and in the freezer makes the whole process easier quicker and more like a shake. If you really want it to pack a punch then adding a green powder (spirulina chorella) Maca powder, cacao (although this doesn’t really temp me with the greens apparently it is nice!) Protein powder (hemp, pumpkin seed, pea), camu powder (for some extra vit c), goji berries, manuka honey, oats (will really bulk it up!) ginger also gives it real zing both health and taste wise!